A recent repost from our Facebook page. 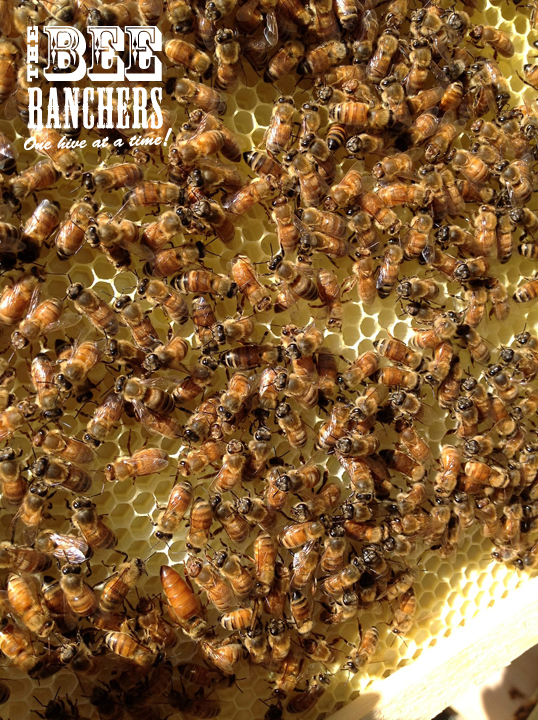 Ranch Foreman snapped this shot while checking one of our client’s new hives. There are a lot of bees in this shot but one is not quite like the others! Can you find her – the Queen? Drop us a line with your guess. We might even give something away to the first person who guesses correctly! Who is it gonna bee? Our family has been waiting for this day for a couple of weeks and it did not disappoint. There was the nagging question that went through my mind several times, “What does a package of bees look like?”. The pics below answer my question. 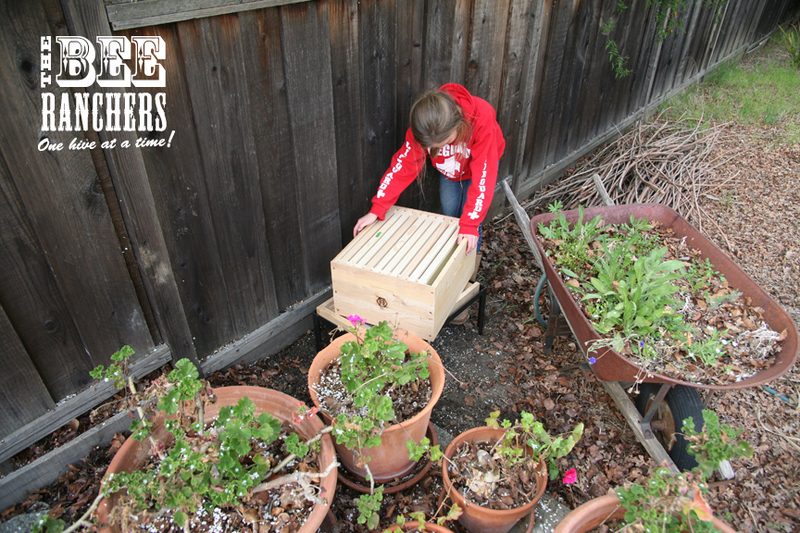 …282,000 – 376,000 honeybees, destined for good homes and the great honeybee habitat of various locales of the Bay Area! Many are headed to Alameda, while others have further to travel throughout the Bay Area. 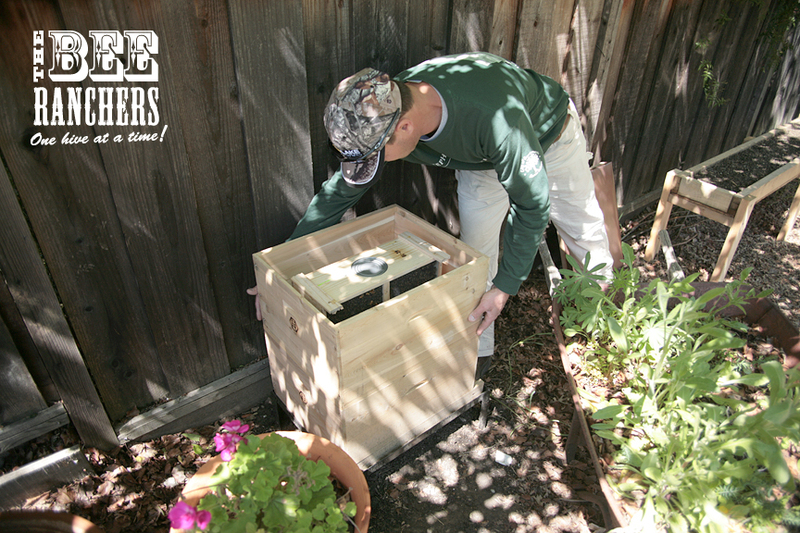 For now, the package of our bees have been placed in the hive as you see in the picture below. The reason being, Mike will come back later this evening to “hive” the bees. Evenings tend to be a good time to “hive” bees as they are not prone to immediately leave the hive to forage and disrupt the colony’s new home. If you are curious what they sound like packaged the way they are (I was), I describe it in this way, take a ice cold coke, pour it into a glass with ice and listen to it bubbling. Kinda sounds like that! We’ll report back to you all on our new colony once they have been hived. 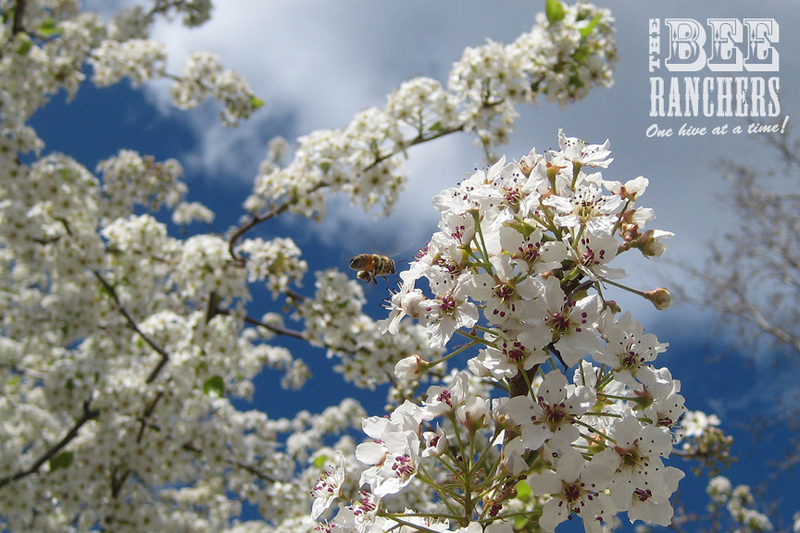 The first for The Bee Ranchers in 2012! Got a call from a client in Walnut Creek. Was a pretty text book rescue. 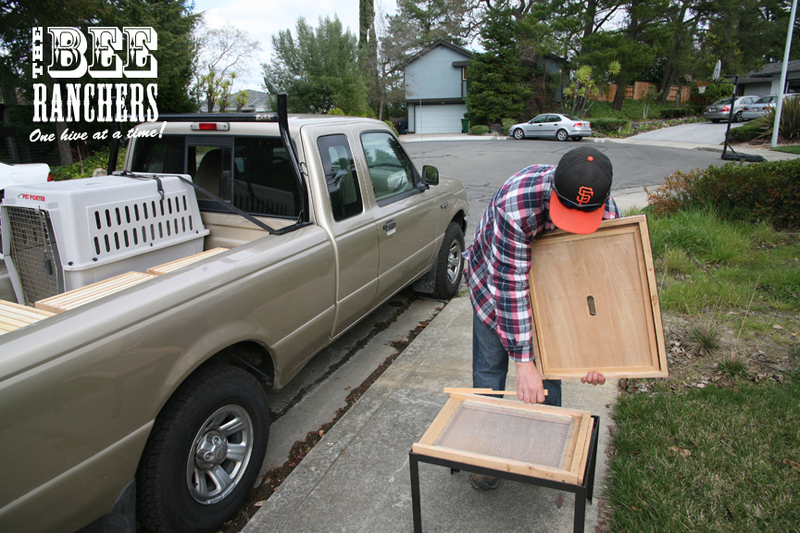 We ended up bringing the swarm to a friend and fellow beekeeper in the East Bay. They’ll be well taken care of. Love the shape of the swarm in this shot. The first of 2012 for the Bee Ranchers! 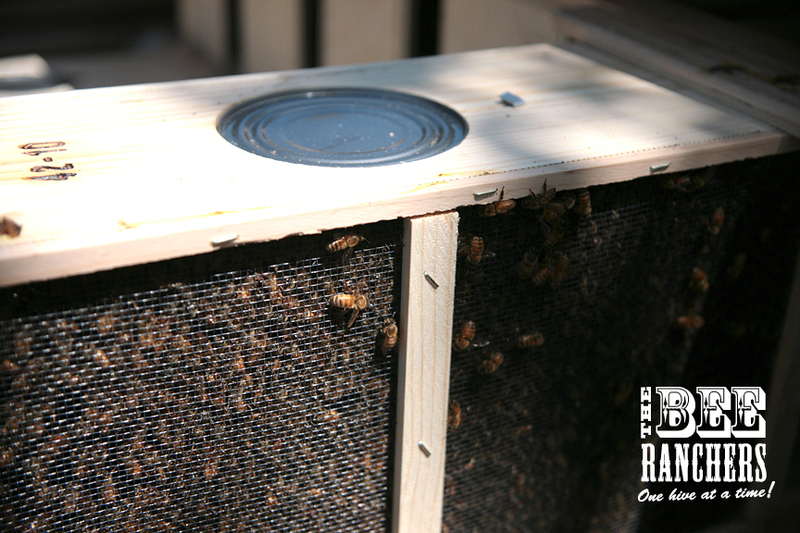 Technically there are two different types of Bee Rescues that we’ll perform for our clients. The first is the Swarm Rescue which we’ve briefly discussed in a past post (HERE). 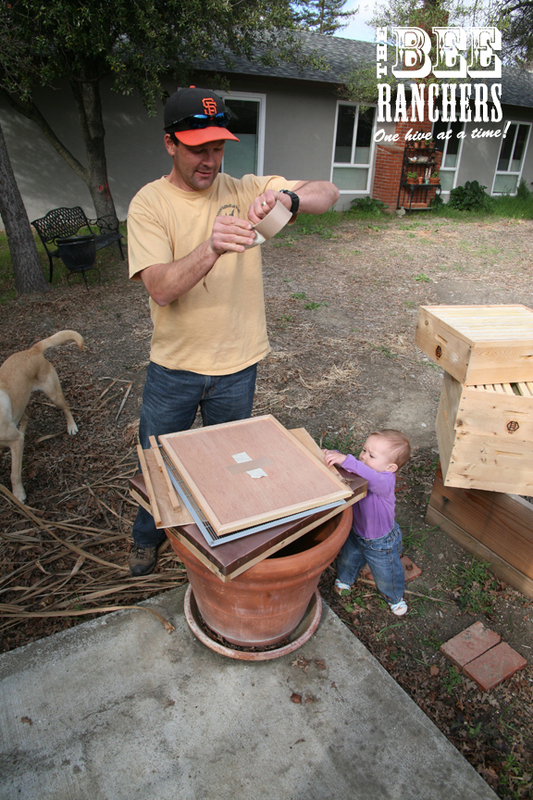 The second is a true Hive Rescue, which is very different from a Swarm Rescue. Take for an example the picture above. 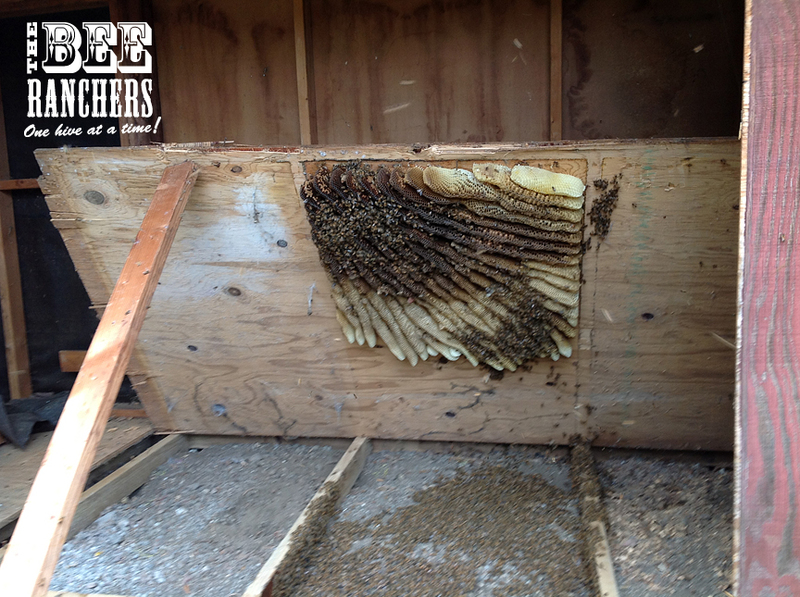 This image shows a hive that had naturally developed underneath someone’s garden shed floor boards in Concord. 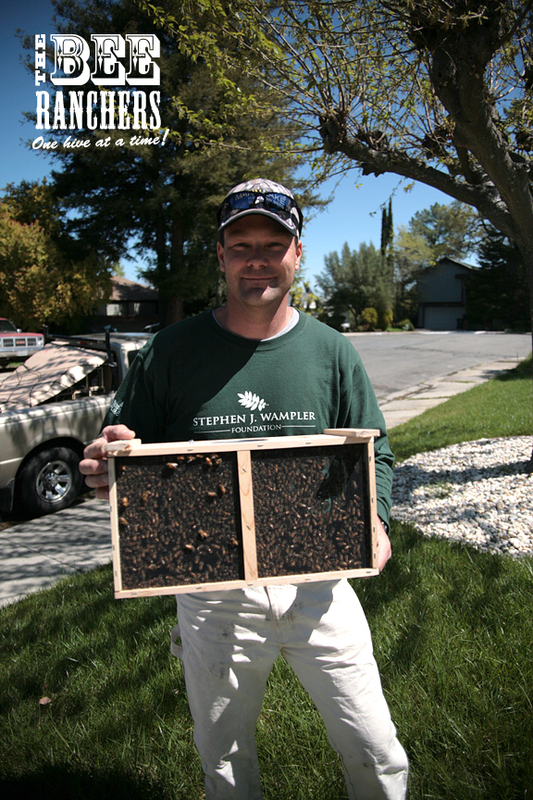 This owner was thoughtful and smart enough to look for a Bee Keeper and not an exterminator to take care of this problem. Remember the simple rule, NEVER HARM OR KILL HONEYBEES. They are far too precious of a natural resource to do so. 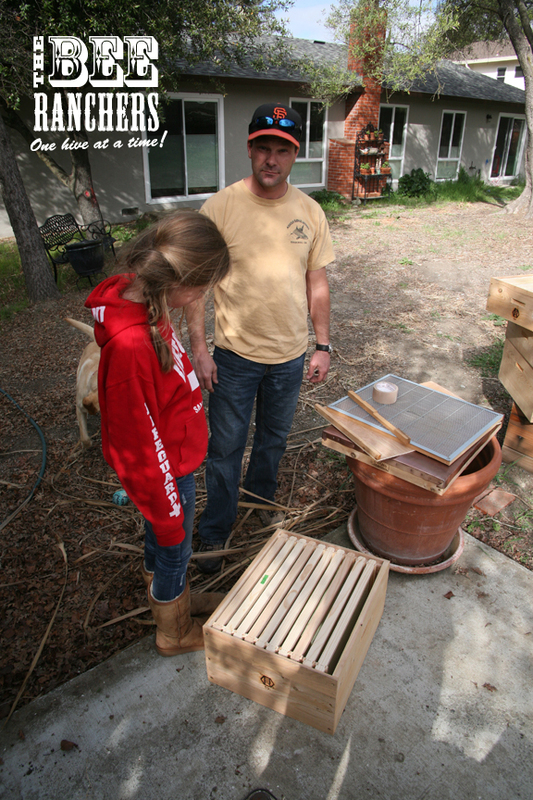 Once we assessed the situation we properly prep’d the hive and the bees, removed the natural comb from the flooring and placed within a friend’s empty beehive. With luck the honeycomb that has been transplanted into the new hive includes the Queen. A good indication is when the bees start entering into the new hive (as you’ll see in the video posted below. Viola! The honeybees have a new home. Once this activity has taken place we will usually leave the new hive in place near the old natural location to let the colony settle and ensure all the bees make it back inside the new hive. 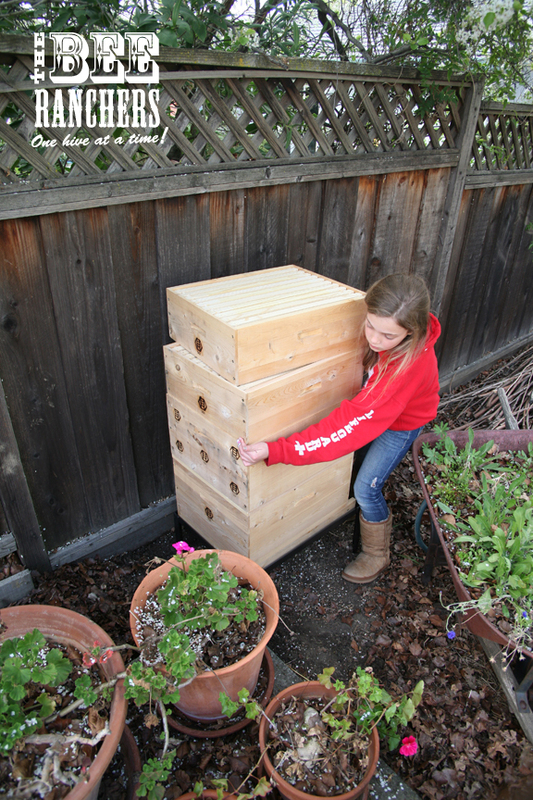 Last we heard, this hive is doing well in Orinda! Enjoy these two videos from the rescue. And by the way, a huge shout out to the property owner for not going the “exterminator route”. He was well rewarded with a nice helping of natural honeycomb from the hive that was laden with fresh natural honey. And we forgot to mention, he did not pay a dime for our services! 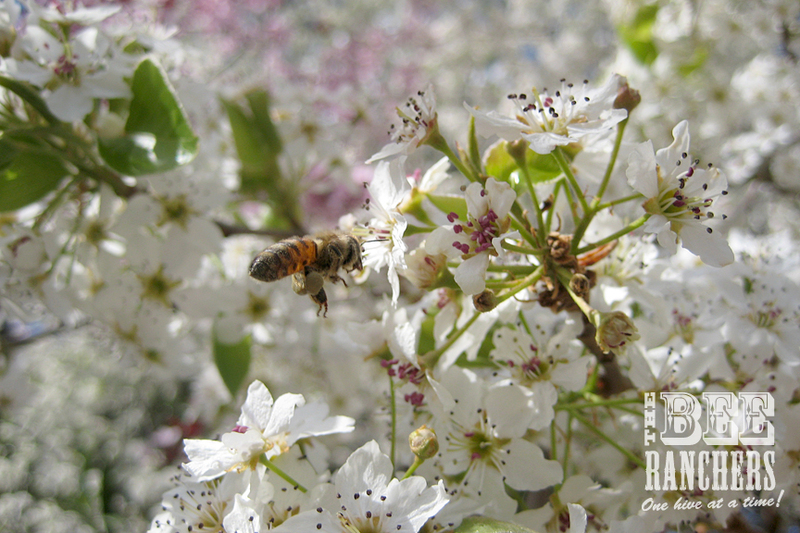 A true WIN – WIN – WIN – WIN situation for us all (the home owner, the honeybees, The Bee Ranchers and our environment)! Brand Foreman gets a hive! I’m excited to announce that I officially have a hive in my backyard. Hive #001 to be exact (by request). 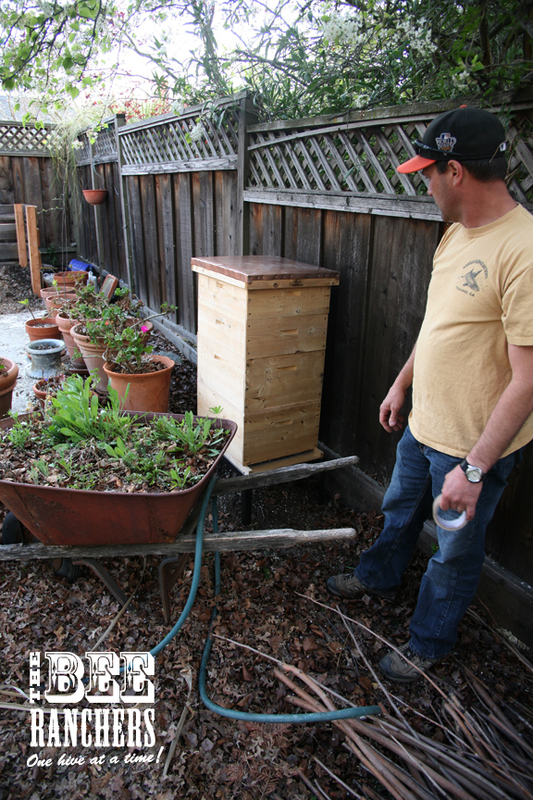 Mike (The Bee Rancher) and Ranch Hand Morgan came by last weekend to set it up. A true family affair. Full disclosure. I’ve never owned a beehive before but have been around them from time to time at Mike’s house. It was great watching and documenting the whole affair. I’m excited to add this new facet to my backyard ecosystem/landscape. Now I should also mention that what I actually have is an empty beehive. 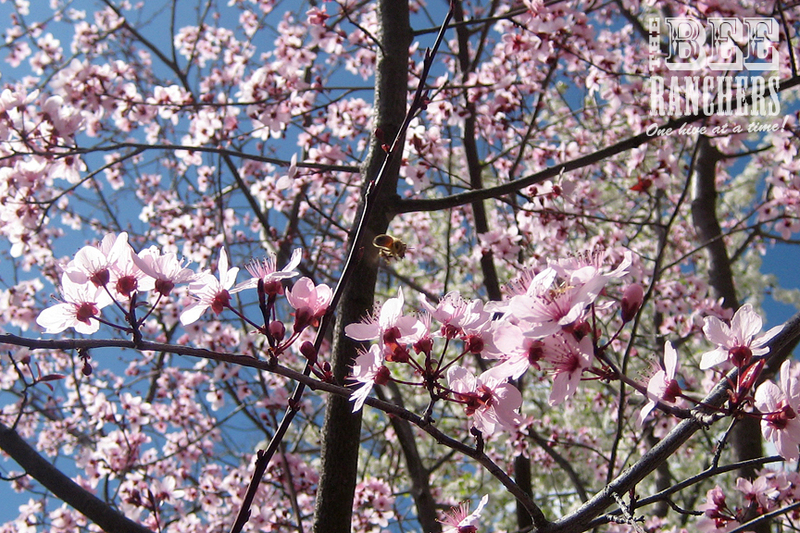 The bees do not arrive until mid-April. Yeah, a little anti-climatic but in reality it is actually a good thing as it gives me time to acclimate to the location I have chosen for the hive. The location of the hive (X marks the spot) is something Mike and I discussed in some detail. There are some key factors in choosing the right location. Ideally an area that gets a good amount of morning light. Certainly a location that is a fair distance from high traffic areas. 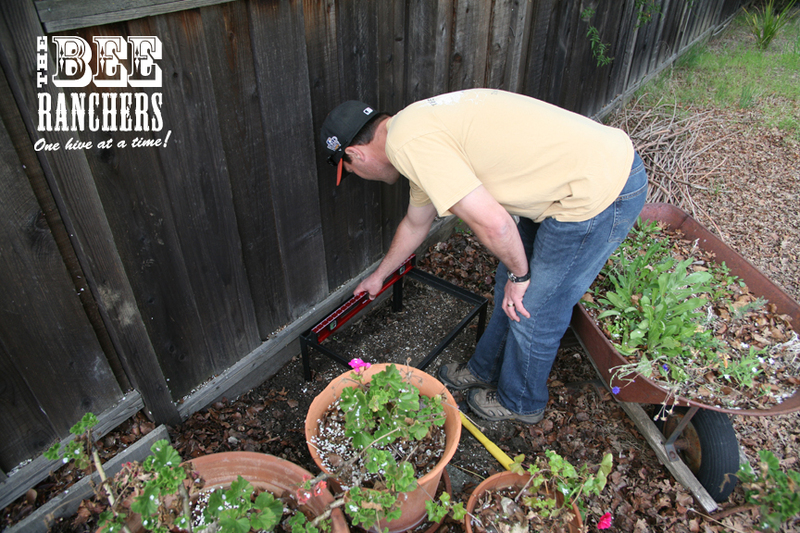 And a location that is reasonably accessible as the hive will need to be tended to as Mike performs his care and maintenance. I think we found a great location that fits all those parameters perfectly. My location highlights the hive in my backyard and may very well serve as a focal point. There certainly are other areas that would be suitable but less visible. As you’ve probably seen, these hives are beautiful, so I want to be looking at mine on a daily basis. Plus Mike tells me there is nothing better than kicking back near the hive after work, cracking a beer and watching the honeybees wind down their day as well. Can’t wait. The beer is chilling in the fridge, now all I need are the Honeybees! Some additional pictures of the hive installation below. Spring swarms & Spring training! 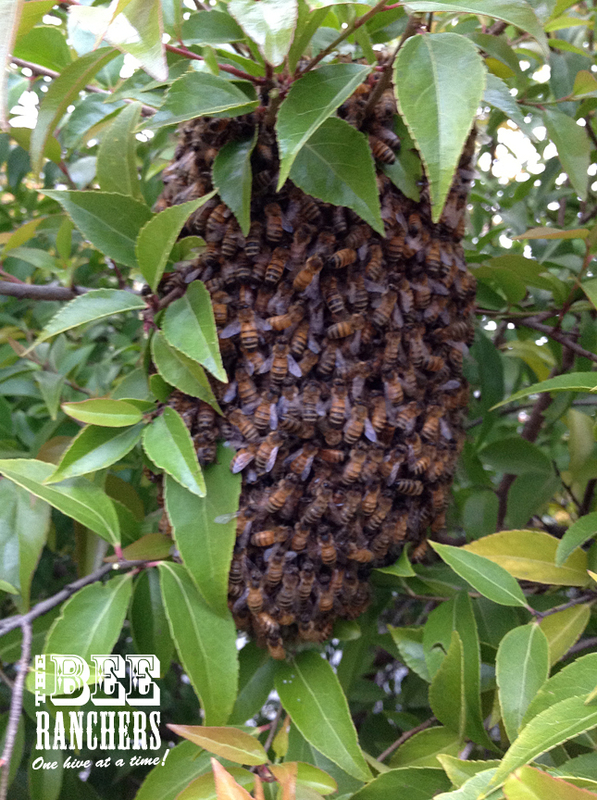 We wanted to let all of our clients/followers know that we are just beginning to hit the swarming season for bees. This typically starts in the Spring time, right around the start of baseball season as you’ll see through the following video. GO GIANTS! Honeybees will at times decide to leave a hive and start a new colony. They often will gorge themselves with honey and leave the hive on search for a new home. Typically what we see is a mass of honeybees clinging to random objects, trees, decks, automobiles, traffic lights, dug-outs, you name it and they might swarm it. Fortunately they do not swarm humans. In fact when honeybees display this behavior it is good to know they are at their most docile – due to being gorged with honey. If you see a swarm, don’t panic! It is actually quite an interesting sight from a safe distance. Obviously if reachable, don’t let kids or animals mess with them. If you have time and are not alarmed, just let them be and they will most likely move on to their next location within 48 hours. If you do want them removed, give us a call and we’ll hive them and provide a new and safe home for the colony free of charge. And under no circumstances let anyone tell you to eradicated / kill them, which in our minds would be a tragedy. “Leading the bees away with cotton candy and lemonade” sounds a bit suspicious to us!? 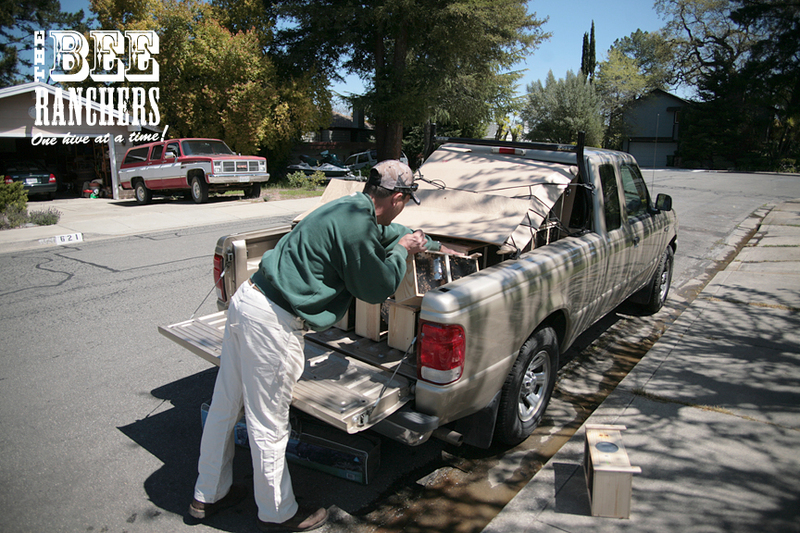 The picture below is one of my “Ranch hands” taking care of and collecting a swarm off of a parked vehicle. Have you ever witnessed a swarm before? Where is the weirdest place you’ve ever witnessed a swarm? We’d like to hear your stories, drop us a line. 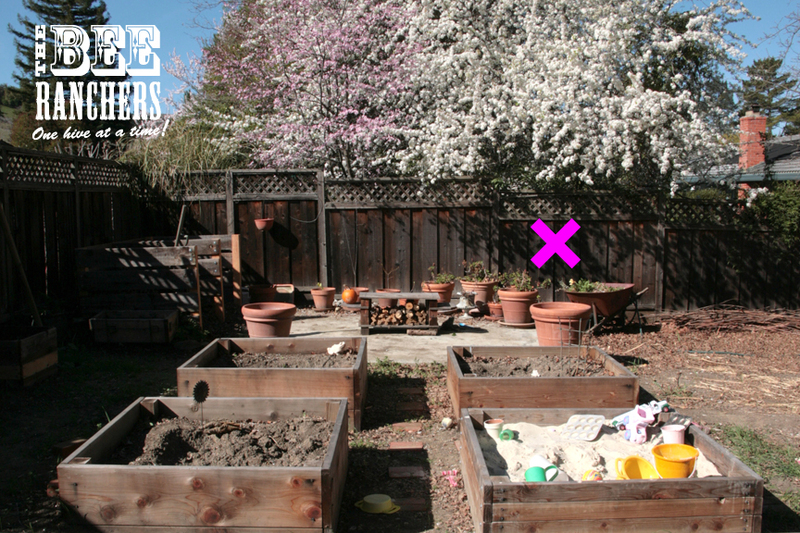 If the blossoming and buzzing fruit trees are any indication, the answer might be yes! 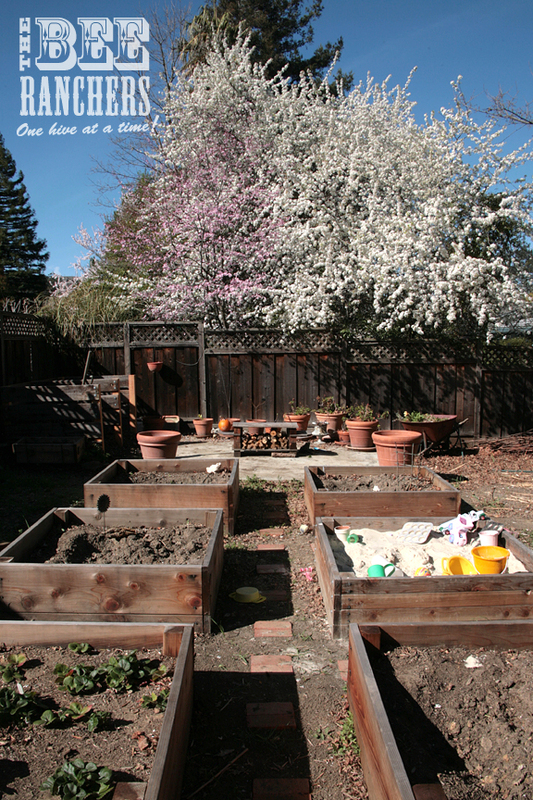 The image below (Brand Foreman’s backyard) is probably a common sight throughout the Bay area lately. Hard to walk outside or drive around without seeing many fruiting trees with their blossoms on full display. 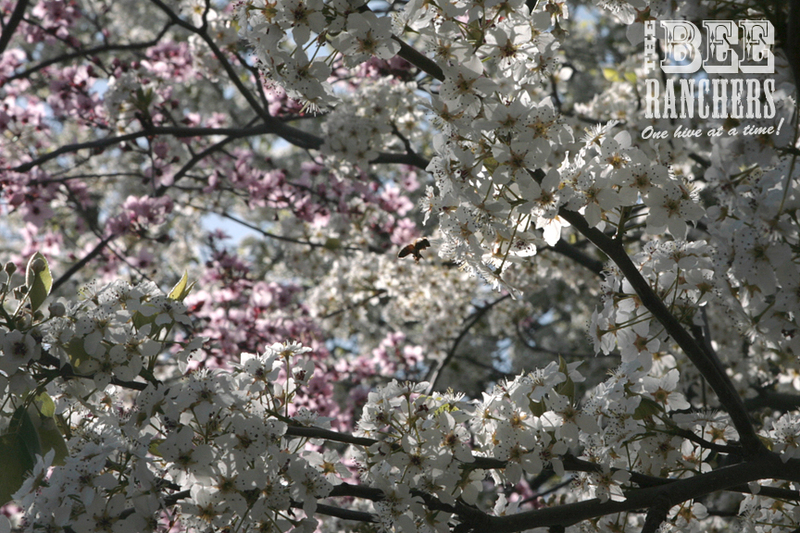 Just standing near one of these trees and it sounds like Spring is humming along! The trees in my backyard are literally humming / buzzing with activity. The honeybees are going nuts! An awesome site to see and cool thing to hear this early in the year. 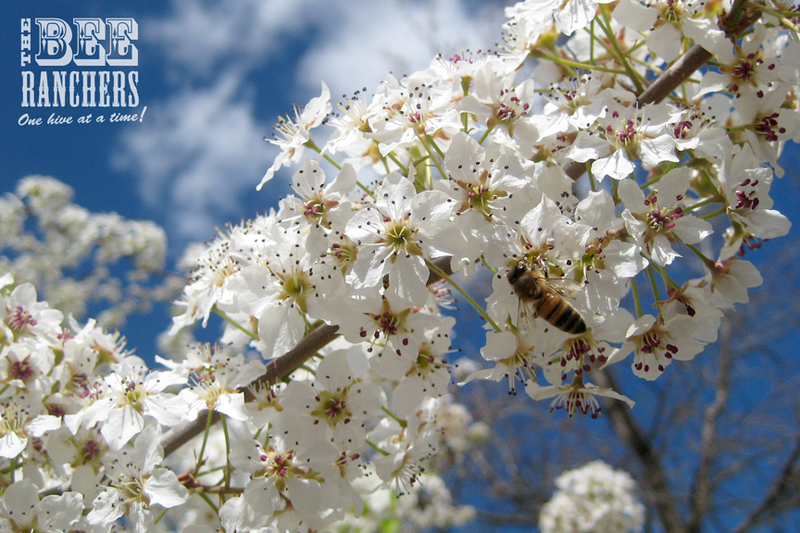 We can’t help but wonder what this portends for the honey harvest this year – an early bounty perhaps? Only time and eventually the bees will tell. Below are some additional shots I took on a lunch break in the backyard on 02/27.